NBC correspondent, Leanne Gregg, reports from Ft. Hood. The trial of the accused Ft. Hood shooter has gotten underway. 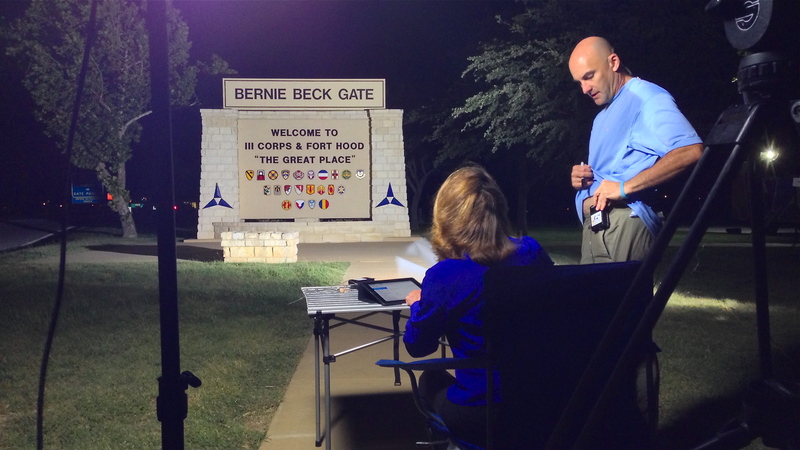 I headed down to Killeen, TX, home to one of the nation’s largest army bases to cover the story for NBC News Channel. I was shooting on the Panasonic HDX-900. Leanne Gregg prepares to do some “Tags” in the early, early morning. Our first few days were spent outside the main gate of the base. My call time was a bit on the early side, 2am to be exact. Yikes. My first setup was literally in the middle of the night. I used a 400w HMI with a Chimera attached to light my subject. I then used an 800w HMI to light the main Ft. Hood welcome sign. Once the sun came up I killed the 800w HMI, took off the Chimera that was attached to the 400w HMI, and then set up another 400w HMI to evenly light my subject. Once I had my light situation taken care of I added a scrim to block the sun from creating harsh shadows on my correspondent. 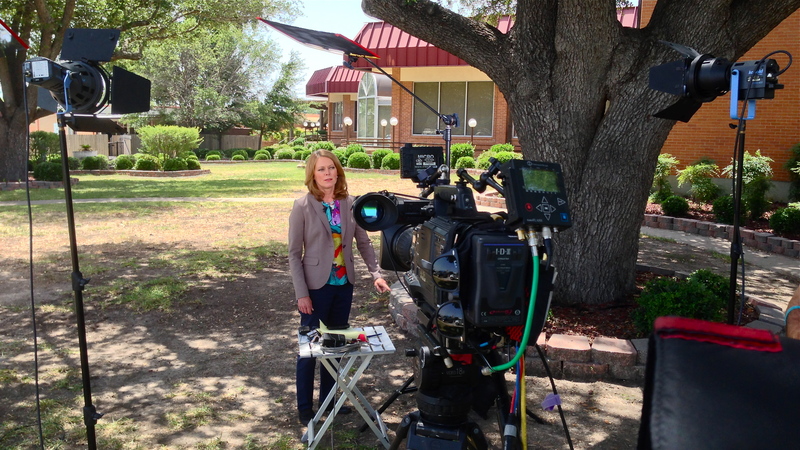 We did live shots here for two days. My final day covering the trial was done on the base. We were escorted to the media center parking lot where other crews were set up. Luckily we didn’t have the super early call time we did the other day. I used two 400w HMI’s to light my correspondent. We had some nice natural shade from a couple of trees. I didn’t set up the scrim I normally would. Instead, I used a silk from my trust Road Rags kit to limit the light that hit my subject from above. Before I knew it the time had come to pack up and hit the road for Dallas. It’s always a pleasure working for NBC News Channel and I can’t wait to do it again.